Cycling environment in France is advanced to compare to our situation in Britain. Cycle lanes are well laid and sign posted both in towns and countryside, maintained. Maps are nicely produced and effortless to follow scenic routes. Especially I enjoyed hilly countryside of Poitou-Charentes nead Confolens – small beautiful river views and picturesque villages, as this stamp depicted. 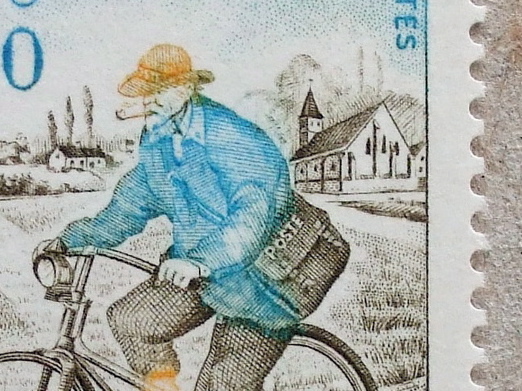 This postman stamp is another example of Intaglio print, which I enjoy a lot with magnifier.